A few years back, I was looking at this absolutely just astounding website for MEAT CAKES with my friend Sarah (some of you may know her as the poster grrl from our facebook fan page Vegan Foods = Joy). Gross as it was - and believe me some of them were just sick - We were having a pretty good time coming up with some vegan versions of our own "Meat Cakes". My favorite was little tacos shaped like cupcakes with guacamole frosting sprinkled with green onions and black olives. 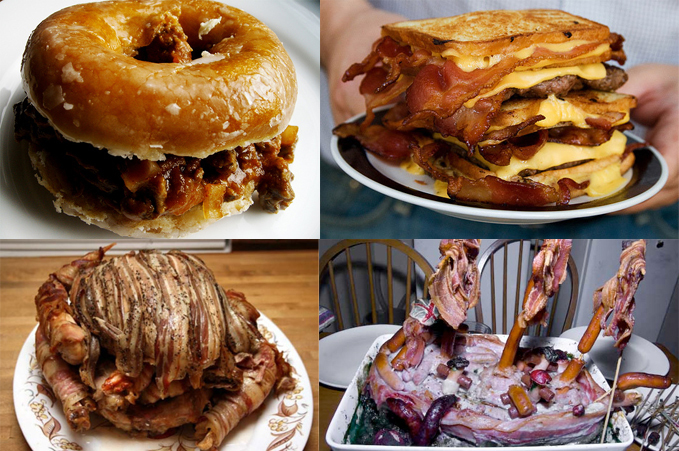 I was actually inspired that day to create the infamous Fake Bacon Onion Ring Cheeseburger "cake" but then one of us had a realization : Most of these so called "Meat Cakes" were just weirdo versions of lasagna with some candles and spray cheese flowers. The second I saw this recipe - I knew. I was making a vegan "Meat Cake". If you are following along in your own Betty Crocker Cookbook, you'll see that there aren't really any vegetables in this recipe. I mean does canned tomato sauce really count as a vegetable? I had pulled some fresh tomatoes out of the fridge to add - I mean - cheeseburgers have slices of tomatoes - right? But here's the thing with a "Meat Cake" : Not unlike regular cakes, "Meat Cakes" aren't solid until you bake them. If there is too much moisture - they don't get solid. SO! I didn't do it. I may try to tinker with it in the future but because I did have to tinker with this one quite a bit to add flavor and of course replacing the ricotta and taking out the eggs - WELL - this recipe is without a doubt, no compromise, assuredly, beyond question, clearly, a super undeniable "Meat Cake". In a pot, add all sauce ingredients and let simmer - stirring occasionally. In your trusted cast iron skillet, heat Olive Oil and Liquid Smoke on a medium heat. Once you feel it's hot, add Fake Ground Beef, Red Onion, Braggs, Black Pepper and Creole Seasoning. Mix thoroughly and let cook until it has little crispy corners and a desired texture. In a bowl, mix Tofu and Nutritional Yeast. When figuring out the layers, I can give you a ballpark of using around 1 cup for each layer, but your casserole dish might be a different size or depth than mine. So, you'll need to eyeball and ration the best you can. Once you lay your first layer, you'll know about what each layer takes. In a glass casserole dish, spread about a ladle full of Tomato Sauce over the bottom of the dish. Put down a layer of Lasagna Noodles. If you have a lot of overlap, pour a little sauce over the spots where the noodles overlap. Spread the Tofu Mix over the noodles creating an even layer. Spread the Fake Beef Mix over the Tofu creating an even layer. Cover with a layer of Fake Bacon Strips. Cover with a layer of Daiya Cheese. Cover with a layer of Tomato Sauce. 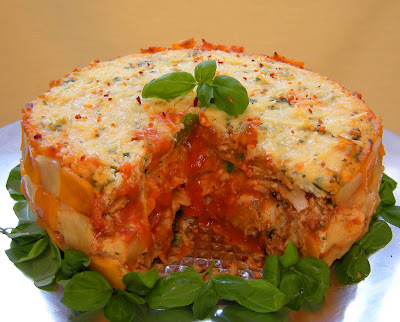 Cover with another layer of Lasagna Noodles. Cover with another layer of Tomato Sauce. Cover with the Daiya Cheese. Bake uncovered for around 25-30 minutes. Please keep an eye on it; smaller lasagnas will bake faster, so yours might bake faster. Remove from the oven when the Daiya Cheese is melted and starts to brown. *Pictured with the great Sci-Fi icon The Millennium Falcon** to show scale. **Not the actual Millennium Falcon. It says in the recipe to mix the tofu and nutritional yeast, but the ingredients don't call for nutritional yeast! HELP, it looks yummy!!! So sorry - I type these up very early in the morning. I'm sure there are dozens of typos that I miss all the time. I just added it under the Tofu. You'll need 2 Tablespoons of Nutritional Yeast to flavor and help bind the Tofu. I hope you like it - I had some for lunch today and I love the smokey-ness and Creole seasoning! great!! I am so excited, my carnivore husband has agreed to some of my yummy food, and I think this is just the one to break him in to the good stuff!!! What temperature did you use to cook this? Sorry made it more clear - Preheat oven at 400. Thank you for undertaking the vegan alternatives. I'm not the most creative cook, and i don't really like cooking, but I've had it with the inhumane treatment of animals. I had been a vegetarian for 6 yrs, when single. Once I married, I went back to animal consumption. My husband isn't ready to become a vegan, although he does accept less and less animal products in his meals. So far we've switched to only humanely raised animal meats. Still cruel, but moving toward the goal.